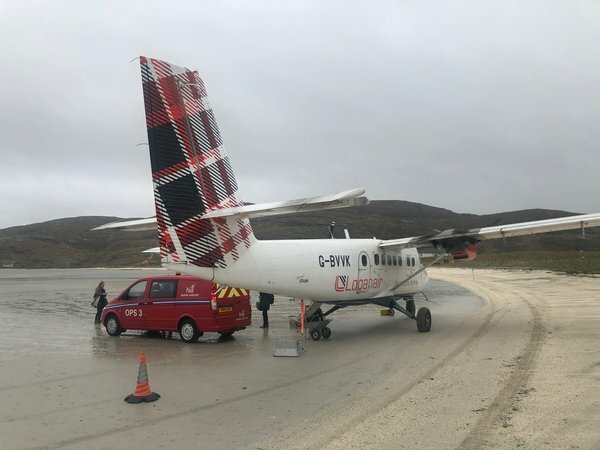 How I landed on the beach at Barra! 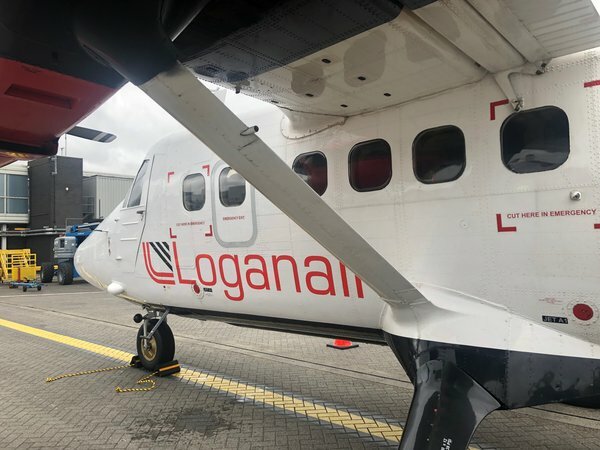 This is my review of my trip to Barra in the Outer Hebrides, flying with Loganair. 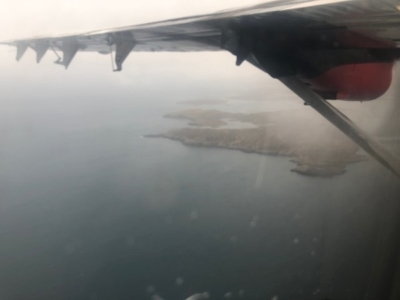 I’m not really a ‘bucket list’ person, but one of the few aviation-related trips I have been wanting to do for many years was Barra. Barra is an island in the Outer Hebrides with a population of 1,100, of which 75% speak Gaelic. It is not your usual tourist spot. 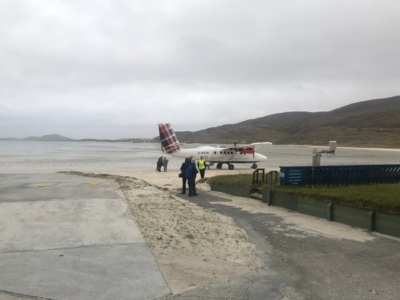 For the aviation fan, however, Barra is a special place. 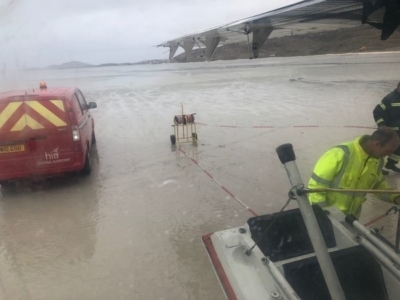 It is the only place in the world with a scheduled flight which lands on a beach. Who needs a runway, or runway lighting, or any of that boring stuff? All you need is a bit of sand and a low tide and you’re in business. I would also get to swap my traditional First Class long-haul suite for a seat on an 18-seater Twin Otter turboprop. And, even better, I could do the whole thing on a special £77 day return ticket from Glasgow which Loganair sells during the Winter season until the end of March. Before I go on, I want to flag up the video I made of my trip and which is embedded at the bottom. Our videos are usually 2-3 minutes long and are just an extra bonus. In this case, the video is 7 minutes long – with no music 🙂 – and if I’m honest the video tells the story far better than my photographs do. If you have 7 minutes to spare today, do watch it. You can book Loganair flights to Barra on ba.com as long as you include a connecting flight to Glasgow. However, as the Barra flight is not a BA codeshare, you won’t get any Avios or tier points for it. It is cheaper to book each leg separately (I used Avios for Heathrow to Glasgow) especially if you are flying during the October to March Winter season when the £77 day return ticket is available. 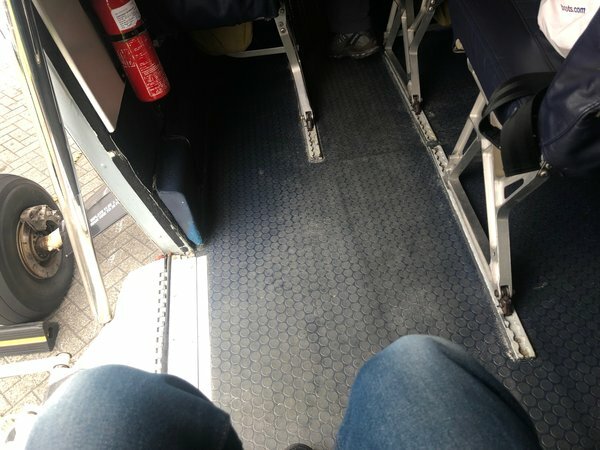 This is NOT bookable online and requires a telephone call to Loganair. Flight times depend on the tide times and so vary from day to day. 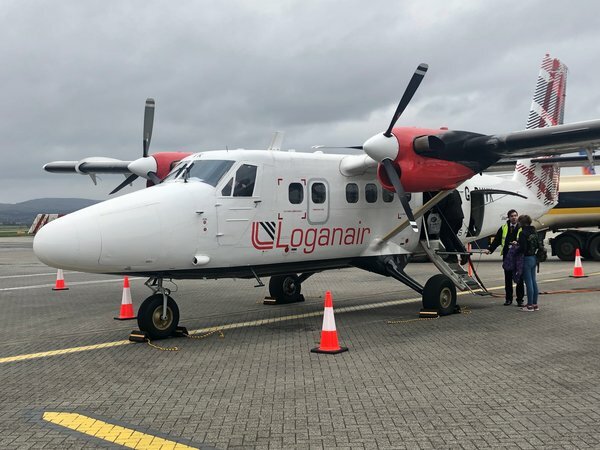 Because the flights also need to fit around the rest of Loganair’s schedule, you can end up with either a very short or very long day trip. The total price was £77.18, of which £29.71 was airport tax. Loganair only got £47.47 from my ticket. Luckily these routes are subsidised by the Scottish Parliament. Because there is nothing near the airport, this worked quite well. I landed, had a very pleasant lunch in the terminal cafe, went for a 30 minute stroll across the dune to the beach on the other side of the island, walked back, checked in and flew back. It was just right. You may prefer a longer day trip – you can hire a taxi to take you around the island, I believe – or even an overnight stay. …. the procedure at Glasgow Airport is obviously the same as if you were flying anywhere else. There aren’t any airbridges here, however! If you have checked luggage, it goes into the hold via the hatch you can see in the photograph above. There are no cabin crew here and so no in-flight service of any kind. The pilot comes out of the cabin, which has no door, and does the safety demonstration him/herself. It is all part of the experience, however, and when the clouds broke there were some terrific views of the Hebrides. The video shows more. The video shows the landing in detail and I recommend you take a look. A lot of spray is kicked up as the plane runs along the beach which makes it even more dramatic. You are VERY alone here. Apart from the terminal building, you can see one house around the headland and that is it. This is Terminal 1 at Barra International 🙂 Richard Rogers and Norman Foster appear to have been otherwise engaged when the tender to design this airport came out. In Part 2 of this article I’ll give you a detailed tour of the terminal building (!) and the nearby attractions. You can read Part 2 of my Barra review here. I shot quite a lot of video during my flights including the landing and take off – click the image below to view it. If you can’t see it, click here to visit the Head for Points YouTube page. You can also subscribe to our channel via that link. Click here to read Part 2 of my Barra review. Rob – this is the best article EVER I read on HfP in the last four years! Thanks a lot for such an insightful piece. I remember I was one of those who asked you to write an article on this flight and here we are! My partner and I are keen to do this trip some time soon (maybe not this year though as we are going to Faroe Islands! Via Scotland too). Indeed. I’m surprised Thames Water isn’t paying David Hockney to decorate the new super sewer pipes being buried down our road ….. with a guaranteed fixed annual return on their capex of course. A friend did this trip a few years back. He got diverted to Benbecula and Loganair asked THE school if they could borrow THE school bus and THE driver to take them to the ferry. One of the really hilarious things is the directions at the airport exit: left for Castlebay or right for Castlebay, no other destinations. And the runway has signs that the beach is only closed when the windsock is out, so walk on the runway anyone? The BBC tv programme ‘Grand tours of the Scottish islands’ was recently repeated up here. There is a segment from 3m30 to 5m45 about the airport, although with it only being a short programme it’s worth watching the other 12 minutes to see the beautiful beaches and pother history of the island. When I worked on Barra, there was a rumour about one of my colleagues, who supposedly had never found reverse gear on her car. She supposedly always just continued around theisland. Surely you meant “bucket and spade” list? My wife and I added this trip onto the end of our honeymoon a few years ago. Someone had phoned ahead and tipped them off so not only did the pilot pass on their congratulations at the end of the safety demo but we were met on the sand with a delicious cake that had been baked and decorated for our arrival. Just superb. Fantastic experience and that beach that you walked to Rob is not any busier on a glorious sunny summers day. “Baggage reclaim” was a bus shelter with a table inside it! I got married in Sept 2002 and we went to Vattersay (joined onto Barra) on the second week of our honeymoon. We went to the cafe one day and decided to go from Barra to Benbecula return for £30 each 🙂 . I always remember on the flight with the water swooshing up beside the windows on take-off and landing. I notice that one of the pilots is a woman. Now, we remember that there was a young lady (I think 21 or 22) who had grown up on the island and always wanted to become a pilot. We may have been on her first flight in charge.I wonder if it is the same pilot? Barra is beautiful and we have an amazing picture of that beach you were on. Reminds me of the TransMaldivian seaplane transfer from Male to the Conrad except their Twotters had floats instead of wheels. 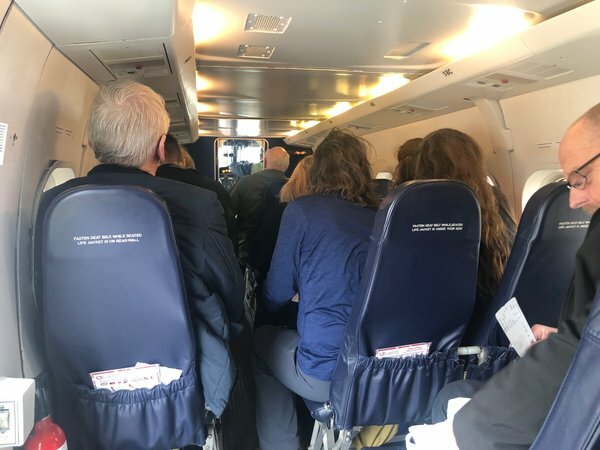 Also, they dished out earplugs – did Loganair? When you say “a bit smelly” can you clarify please? Smelly due to what exactly? Engine fumes/fuel/oil? Or smelly due to nervous flatulence emanating from some or indeed all of those sat in front of you? Fuel smell. Coming back in 2A it was less smelly! Love the video. Thanks for this. I enjoyed that clip, especially seeing clear waters of the UK. I wonder how smooth the flight would be in a storm or do they make a lot of cancellations? I’ve wanted to do this for a while but didn’t know about the £77 return ticket. Really useful to know about for next winter! I tried to make this my 100th flight; out by one but still really enjoyed ticking it off the avgeek bucketlist! I actually stuck around for a few days, and managed to get weather good enough to leave with a sunburn… I visited Castlebay, did a couple of coastal walks (including Vatersay) and hiked up the big hill: for anyone planning a longer trip there’s some details of all that on my blog: https://travel.straylight.co.uk/?cat=137 (plus the obligatory photos / video of the flights and airport; I got lucky with an extended scenic loop approach to the beach). I have done this trip twice and was lucky enough on both occasions to have superb, clear and sunny weather and when you do have that the scenery is phenomenal. Try and get the back seats as they offer the most unhindered views. It is a different flying experience and can be very rock and rolly so not too good for the nervous flyer but an unforgettable moment. The island itself is well worth a look around if you can manage a stay there. 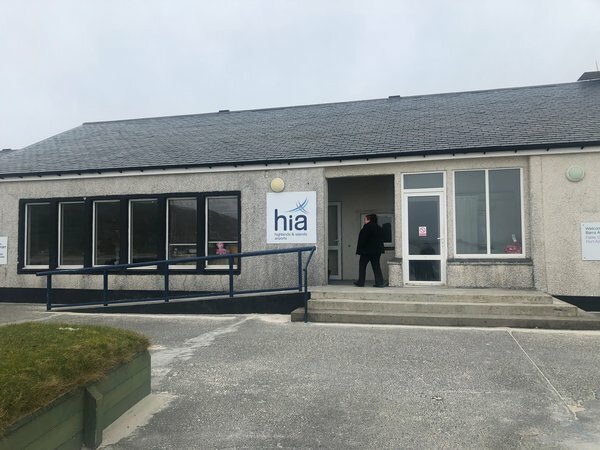 We booked in at the Craigard Hotel in Castlebay on the second occasion and The Isle of Barra Beach Horel on the first.